I might read it but I'm afraid it would boer me. Love the guy's nonchalant expression, and the pointy chin is a good touch. In particular, I love it that the bottom of the "cover" gives the hint a big gut! Not your usual Sci-Fi hero! Love it. Now we just need an author! Ouch that was a zinger. 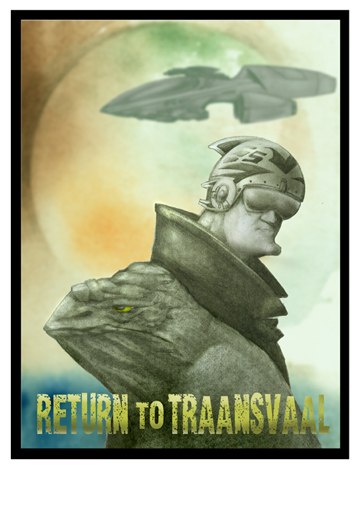 Paul "Flash" Studley, solar system pilot of the 42nd degree awaits his cargo, a short toad-like ambassador to the obscure planet Transvaal. Not exactly an important mission, but as he ages beyond his prime and the intergalactic depression continues, he was happy to get the work even though it was as far away from significance as one can get. Studley was a legend. A legend in his own mind at least. It was he who coined his moniker "Flash" - having misunderstood the Korelian translation, which was actually "Crash". As in 'Crash and Burn', which tidily summed up Studley's career to date. It wasn't hard to understand how he'd missed the translation. Walking around with a perpetual .30 blood alcohol level will do that to a person. Studley liked to brag that there was no destination that he would not fly to, nor any cargo that he would not carry. Thus the string of crashes in his career. The miracle so far had been his ability to walk away from each of his "adventures". I like this site very much, Its a rattling nice situation to read and incur information. This page contains a single entry from the blog posted on March 30, 2011 12:53 AM. The previous post in this blog was Post What?. The next post in this blog is UNMADE (pencil study).